OK, I know New Zealand is a long way away from where you are, unless you happen to be reading this in New Zealand, of course. And yeah, there are too many books on fly tying around and it isn’t that long since I said I would throw myself on the floor and scream and drum my heels if someone sent me another book on the subject; but here is another one and despite myself I have to confess that I enjoyed reading it. Hugh McDowell claims to have taught hundreds of people to tie flies, including a man who was missing two fingers, a customer with an artificial arm and an old lady with such bad arthritis that she couldn’t use a knife and fork. Faced with such claims, my normal response is to smile and back away slowly, but having read New Zealand Fly Tying, I have come to the conclusion that if I ever do lose part of a limb, I am going to search Hugh out and get some tips on how to wind hackle. This paperback second edition is a wonderful pot-pourri of fly tying exercises, patterns, tips and tricks, fishing yarns, and vignettes of anglers, spiced with the sort of observations about flies that you don’t get to read in mainstream fishing magazines. There is so much sound advice in here that I would recommend the book to anyone who has even thought about taking up fly tying (which might not be a bad idea, with winter approaching). 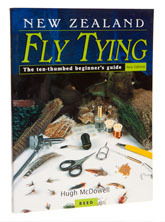 While I am not certain that you can actually learn fly tying from scratch without some kind of lessons, anyone with a scant knowledge of the basics ought to be able to pick this book up and broaden their horizons in a single bound. The only trouble is that I can’t find a UK distributor, but you could always import a copy.